Although the Galaxy Tab S3 was the main star of Samsung's MWC 2017 press conference, the fact that the Galaxy S8 skipped the event overshadowed the launch of the tablet. However, if you're not really looking for the latest Samsung tablet, here is a decent deal that you can take advantage of until June 17. Samsung USA offers the Galaxy Tab S2 9.7-inch for just $399, which is a good $100 off the retail price. The deal is available at Samsung's online store, but customers can also pick this one up via Best Buy until June 17. 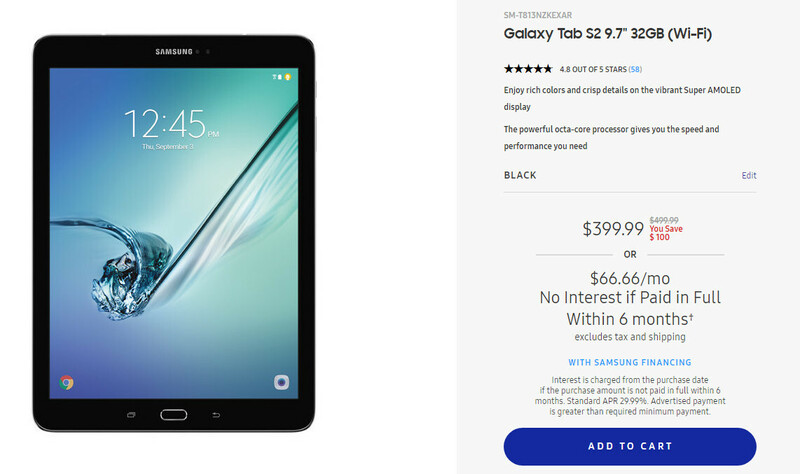 Alternatively, you can get the Galaxy Tab S2 9.7-inch for $66.66/per month (excludes tax and shipping) with Samsung Financing. Samsung Financing allows you to get the Galaxy Tab S2 9.7-inch for no upfront price and no interest if paid in full within 6 months. According to Samsung, customers who order the Galaxy Tab S2 9.7-inch will get it in 1 to 3 business days, and free shipping is available on all orders. The same goes for Best Buy for those who decide to purchase the tablet from the major retailer. It's almost 2 years old, still a decent tablet but I doubt it will receive much for updates since it's a Samsung Android device. I own the 8inch version and its an amazing tablet. Picked up the 8 inch about a month ago and really like it. Take it work to watch movies on lunch break. Got Air 2 for home use. Probably be good for couple years for tablets. Keep looking for Nougat update. Android tablets are bad, useless, stupid. Ya just like çŕApple ipads.